Only 1.5% of food that comes into the U.S from foreign countries is inspected. Americans are tired of seeing their jobs lost to unfair overseas competition. Americans refuse to import slave labor conditions. Americans refuse to compromise on environmental regulations and sanitation issues. In our nation, the health, safety and nutritional value of foods are top priority, and rightfully so; since in today’s world terrorism is a fact of life. After all, what we eat contributes to the well-being of our lives. It is time to level the playing field for U.S. farmers; it is time for the U.S. 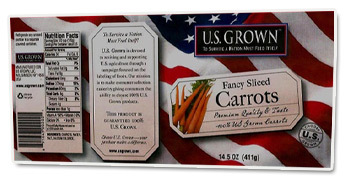 Grown food label program.